With my dinner times often always a moving target, I've learned through the years substantial appetizers are a requirement. Even though an appetizer may need to be "substantial," it should not be overly involved, which is why I'm always looking for something to grill on a plank. 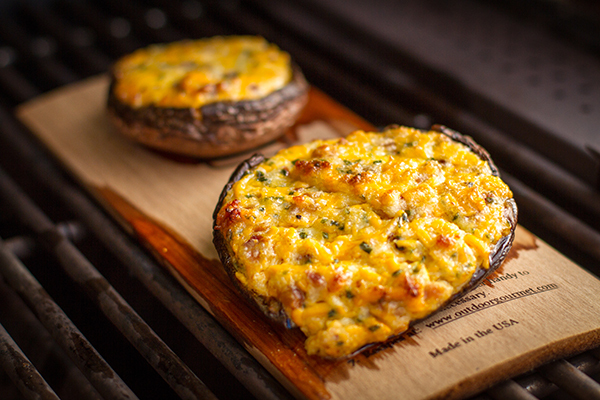 Planked food on the grill is an easy and forgiving way to cook. The plank adds another layer of flavor while also protecting the food from being overcooked or burned when your attention is elsewhere. Not, of course, this has ever happened to me...ahem. Where was I? While it’s satisfying to throw together a bunch of ingredients to make a dish, sometimes less is more, especially when time is short. When I want to concentrate on a great meal, but not short shrift an appetizer, I like to use good quality pre-made ingredients. On a recent trip to a new grocery store, I stumbled across their store made bacon, cheddar, and chive cheese dip. I was looking for an appetizer and already had some large portobello caps in my basket. With a shelf full of grilling planks at home, I knew exactly what I was going to do. It's the kind of appetizer that makes a late dinner all that more acceptable. 1. Soak the grilling plank in water for at least an hour. 2. 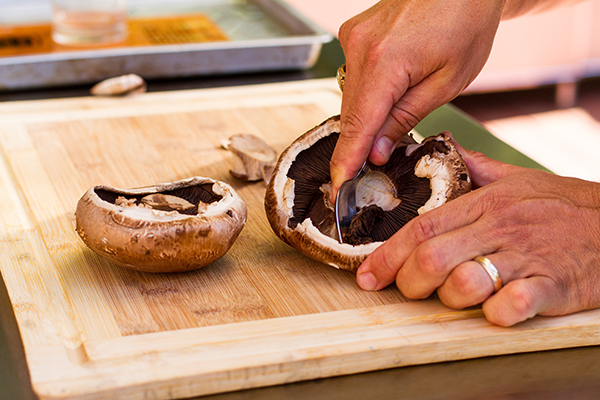 Prep the portobellos by first removing the stem. Then, with a spoon, remove the gills. 3. Fill the caps with cheese dip. 4. Prepare the grill for indirect medium heat fire (350° to 450° F). 5. 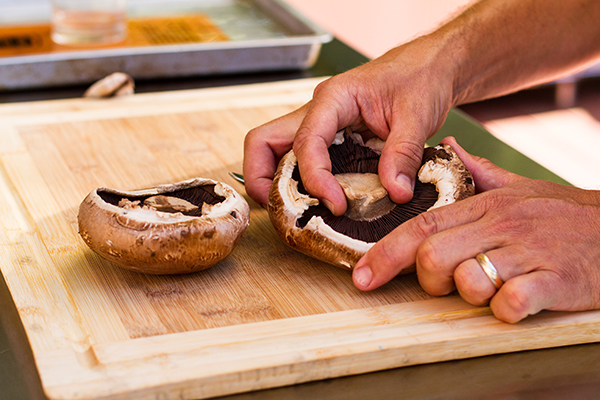 Place the filled portobello caps on the soaked plank. 6. Grill over direct medium heat for approximately 15 minutes. Then, move to indirect medium heat and grill another 15 minutes. Remove from the grill and serve right from the plank. You can certainly make your own cheese dip, but remember, this is an appetizer. It needs to be easy. Save the heavy lifting for dinner. 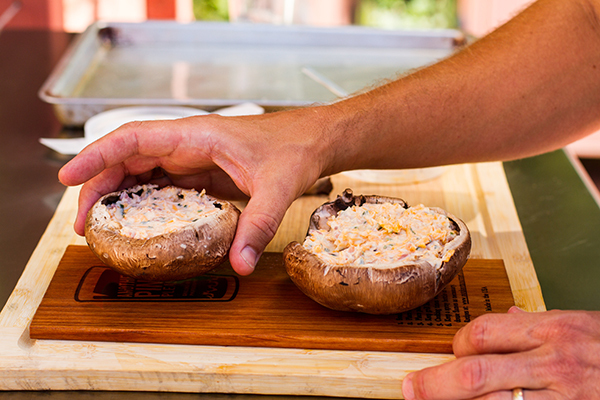 The tangy cheese dip is the perfect complement to the meaty portobello. 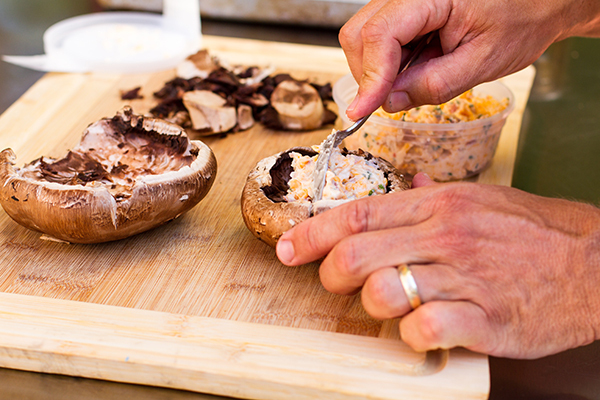 At the most, I give these stuffed mushrooms 15 minutes before they are devoured. "Hangry" has been cured and dinner is on target!